The Amazona amazonica Linnaeus, 1766, called in Italian Amazzone aliarancio, in German, Venezuela-Amazone, in French, Amazone aourou and in Spanish, Amazona alinaranja, is a parrot belonging to the order of the Psittaciforms (Psittaciformes), family Psittacids (Psittacidae), subfamily Arini (Arinae), even though some ornithological biologists prefer to classify it as a tribe of the Arinae, genus Amazona. 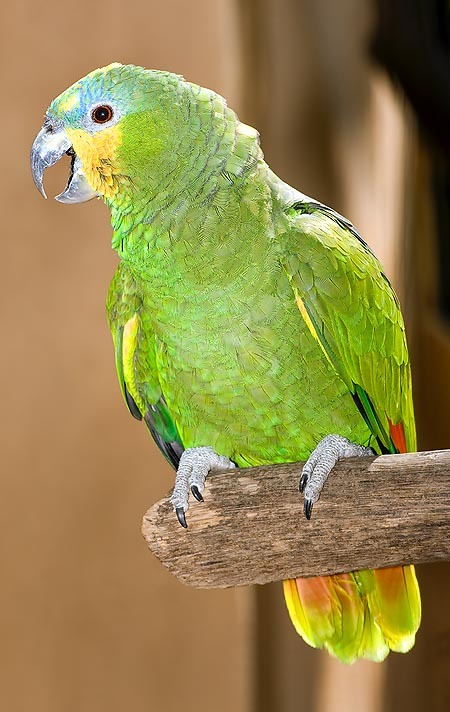 The parrots of the genus Amazona, are parrots of the Neotropical eco-geographic area. This genus should subdivide into 25-29 species and several subspecies, autochthonous of areas and biotopes that coincide with those of the nominal species. In the specific, the species Amazona amazonica, has two subspecies, one is known as Amazona amazonica amazonica, which has been well studied and characterized, living in the same ranges of the nominal species. The nominal species Amazona amazonica and the subspecies Amazona amazonica amazonica have an equivalent biology; the subspecies differs from the nominal species due to a bigger and more orange-coloured speculum. 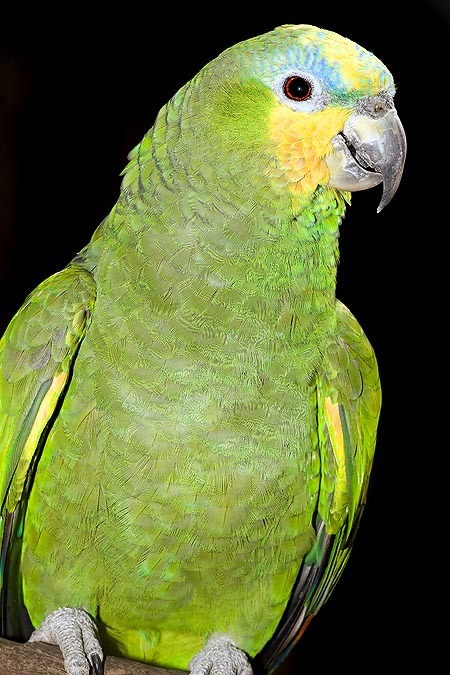 Initially, during the XIX century, some ornithological Spanish biologists did, to say the truth, propose as first subspecies or subspecies the Amazona amazonica tobagensis (the Amazona amazonica amazonica, had not yet been discovered), so called because present on the islands of Tobago and Trinidad, which, however, for many years, was nor recognized as such by various scientific associations of ornithology, because the distribution of the orange colour on the wings and the more extended speculum, which characterizes it, did render it inconsistent with a classification of subspecies; nowadays, this classification has been fully re-evaluated and accepted by the International Commission for Zoological Nomenclature (ICZN), and therefore the species Amazona amazonica is now subdivided into two subspecies: the Amazona amazonica amazonica and the Amazona amazonica tobagensis. The Orange-winged Amazon is present in the northern part of South America. It lives east from Andes, in Colombia and Venezuela, in the eastern part of Ecuador and Peru, in the northern part of Brazil, in French Guyana and in Dutch Guyana, or Surinam. Finally, as said before, the Amazona amazonica tobagensis is autochthonous in the island of Trinidad and Tobago. In these geographic areas, they have colonized all the types of forest, from the mangrove to the humid forests close to the lagoons and great ponds, to the gallery and flooded forests, up to the open humid areas; as a matter of fact, they are found also in the Pantanal, the widest wetland in the world, where even if being birds electively drawn for the arboreal life due to the zygodactylous foot, they are seen also while walking on the ground or standing perched on shrub-like plants. They may live up to 650 m of altitude above the sea level, and have colonized also the South American humid savannahs, where they may utilize, as perches, palms of the genus Mauritia, for instance, the miritì or aguaje; also called moriche, canangucha and buritì (Mauritia flexuosa). They have been observed in small crowds also on bamboo trees forming small thickets. Lastly, they have been found also in drier areas, though occasionally, perhaps during small migrations towards the feeding locations, and also in urban areas inside city parks, where great trees are present. The IUCN still does not classify the Amazona amazonica and its two subspecies, into the “red list of endangered species”, although the population is declining, seen that they are hunted and trapped for being eaten (also their eggs) or being sold as companion animals. Usually, these birds are of a saurian green colour. The feathers covering the nape are slightly bordered of black. The cheeks and the front are covered by a yellow dot which, occasionally, reaches the beak; this is rather big and curved like a hook, of a grey-dirty white colour. The area over the eyes shows a violet-blue colouring, the remiges and the primary and secondary coverts of the wings are bordered of grey-light yellow. The coverts in the inner-most part of the wing turn from the green to the violet, with black tips. The orange speculum, which gives its name to the species, crosses the outermost secondary coverts and, at times, speckles a fourth and a fifth outer covert. The tail is grey (the remiges), with greyish-yellow tips, the outer feathers of the tail are spotted of orange. The skin, in the periophthalmic area of the eye, forms a grey ring; the iris is orange-yellow. The feet are grey. There is no presence of sexual dimorphism, neither transitory-seasonal, nor permanent, between males and females. The pullets have a less intensely coloured plumage; the iris is dark. Both male and female are long, as an average, 31-32 cm and may reach the 50 years of age. These birds may live in pairs of in groups of medium dimensions. Occasionally, in some areas, they may form transitory crowds of hundreds up to a thousand of specimens, resting on the trees and busy in feeding or flying on the ops of the tallest trees. From the morning, they brightly fly all the day, and then by the evening, they go to rest on the perches. Due to the mild temper characterizing them, it is not so rare to observe in the wild specimens of Amazona amazonica with specimens of Amazona amazonica amazonica, resting and eating on the same tree, maybe even together with differente species, such as the Yellow-crowned Amazon (Amazona ochrocephala), the Red-browed Amazon (Amazona rhodocorytha), the Mealy Amazon (Amazona farinosa) and the Blue-fronted Amazon (Amazona aestiva). They love climbing the big branches and bark the same. Both the Amazona amazonica, and the Amazona amazonica amazonica, when flying and when resting on the branches, or on the artificial perches when in captivity, are noisy whilst they keep silent during their meals. Their cry is very intense, metallic and disyllabic. In the wild they eat seeds, fruits, berries, nuts, flowers and buds of various types of trees of the genus Erythrina, Sloanea, Richeria, Byrsonima and species such as Curitella americana, Spondias mombin; at times they nourish in the fields cultivated with cereals. The couplings do take place, in the wild as well as in captivity, by May; the male takes care of the construction of the nest and becomes aggressive during this period. The female lays from 2 to 5 eggs, then incubates them for 26-27 days; the pullets are nourished for about 8 weeks by both parents, before flying away and leaving independently.